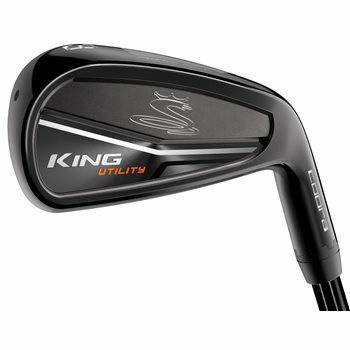 The Cobra King Utility Black iron features a full hollow body design that brings preferred sound and feel and lowers CG for improved launch and distance from multiple lies. The CNC Milling creates highly accurate grooves for consistent spin across the face while PWRSHELL Face Technology delivers Cobra’s largest Sweet Zone for higher ball speeds and explosive distance. The Cobra King Utility iron also features MyFly 8 Technology with 8 easily adjustable loft settings to help you manage trajectory and fine tune launch conditions to maximize distance. Cobra Connect Technology uses a seamless in-grip electronic sensor to track your improvements with detailed stats and analysis. The new Dimonized Black Metal satin finish provides extreme resistance to wear for a longer lasting, better looking utility iron.